No man is a hero to his wife or cat. Maybe canines pass muster with men because the former idolise the latter. As much as feral strongmen politicos who once cried “Havoc!” and let slip the dogs of war are adored by the rabid masses. And then there are the once adulated rescuers of our imperilled democratic-republican project, who would (it seemed then) deliver us from our saviours. They – like the self-proclaimed political messiahs whom they replaced – have gone the way of all flesh: portly, parasitic, vampirically corrupt; towards kitchen cabinets hobbled together in hell and realpolitik-ridden administrations on a rapid no-return trajectory for the graveyard of history. If one aspires to be remembered well, much less fondly, by posterity – one must have testicular fortitude manufactured like an alloy of copper and zinc. On the other hand, if an ambition to head the list when the Great Scorer comes to write against one’s name is to be made of sterner stuff, today’s politicians fall as flat as a “floater” that’s evacuated from a fast-moving train’s toilet. To be truly democratic, one must patronise the plebeian railway everyday – not simply when it will look good on one’s CV or application to join the ranks of would-be statesmen. To be really deceived, one must adumbrate the virtues of politicos who cling for dear life to crowded commuter transport as virtuously as they hold on to their party portfolios. Once upon a time (which is, after all, how most fairytales start off well enough), we would have swallowed such ‘floaters’ with open mouths. Today that cookie has crumbled and the crumbs are not enough to satisfy the train-travelling proletariat, who would eat of the same cake that the patricians they elected to govern do partake of at the taxpayers’ mounting expense. However well-intentioned these knights in shining armour may have once been, they can no longer be considered the cavalry riding the rails hard to redeem the virtuosity of the democratic-republican project imperilled by the previous bunch of cavalier cowboys. Therefore the Up Express is inexplicably delayed – if not entirely derailed – and the hopeful fellow riders of suburbia transiting to the promised station of the New Social Contract must signal and lookout for a new set of heroes. Indeed a new brand of political hero who won’t go to zero in less time that it takes the Southbound Express to accelerate round the bend into the long seaside straight. The track as far as line of sight goes is pretty bleak. Like the slow but sure descent to humid Badulla from the higher cooler climes of Bandarawela on the main line. A president who had every opportunity to immortalise himself as a Cincinnatus-type leader (oh, do look it up!) by relinquishing his powerful reins when the national need was done and dusted is increasingly blotching his escutcheon with the traditional and time-honoured downfall of fame and power hungry politicos who take the road to dusty death. That the premier is not much more of a statesman, treading the primrose path of dalliance with commissioned miscreants in his own backyard, does not bode well for a governor who appears growingly distant from popular reality and only grudgingly willing to nod at harsh and painful realities on the ground – thereby yielding creative space to canny and populist demagogues. Let’s not get our blood pressure up about what that latter cabal of rogues at large is still up to – since government seems to have given up the ghost at last. With the national leadership project looking alternatively like a runaway locomotive gathering steam in the gloom before the tunnel or an abandoned relict from a dead age rusting in the yard, it becomes incumbent on the polity to take the throttle firmly between both teeth. (I’m deliberately mixing metaphors in protest at the executive’s penchant for double-speak, whereby ‘zero civilian casualties’ under a previous dispensation meant we ran over everything in sight like a juggernaut to get to our goal and ‘zero tolerance for corruption’ today signifies that everyone and his brother gets prosecuted except our near and dearly beloveds.) Think for a moment about who might come after the incumbents and that should be enough to give you pause. The business community looks as lacklustre as it did under an erstwhile oppressive regime, sandwiched (like passengers on peak-time office trains) between embarrassed silence at what its champions get up to in public and strong empathy with the cronyism from which it benefits in private. 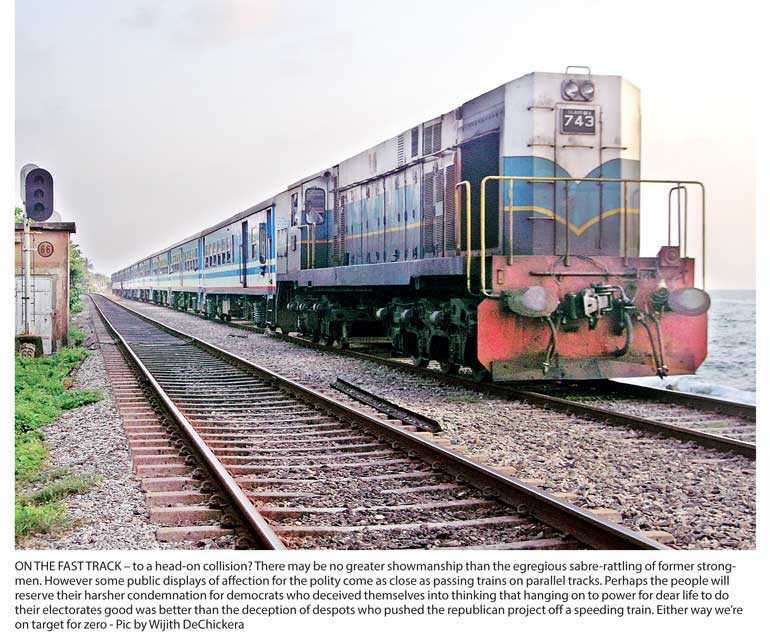 With the exception of a few stalwart academics and less sterling professionals, civil society is as silent as the electrics which are slated to replace Sri Lanka Railway’s antiquated diesel-driven fleet. So to whom can the citizenry at large turn when we need a hero to relieve our tax burdens, turbid political culture and turgid politicos who occasionally take the plebeian train? Feels like it’s a job for the Sri Lankan cricket team! As long as we’re not lulled into a false sense of security that the state of the nation has improved by some fly-by-wire cowboys who can’t tell “turbid” or “turgid” apart from a turd on the track. These may be the Clint Eastwoods among the conservative cowboys, but they’re a country mile more decent and honest than the deadly runway regime whose ouster they championed. Thank me brokenly later, and don’t be gulled by cavalier stunts or hand-me-down antics.